Today is a day of giving honor to Mothers. I think of my Mothers everyday of my world. I can get mighty touched at just the thought of the Mothers of my life. When I came into the Ballestero Family I was barely 18 years old. I wasn’t ready to leave my own mom and yet I thought I was. Mom had trained me well up to the 18-year-old mark. I want to insert this right here. I learned before I got married that if I wanted a good relationship with my husbands mother than I could have it. I was blessed to get into a family that loved me and I thought they cherished me right from the beginning. I still feel cherished and I cherish Mom Ballestero. 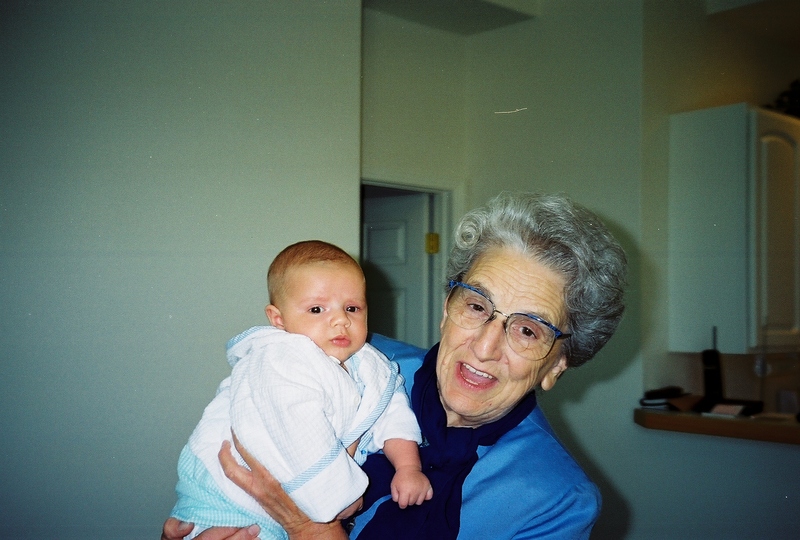 She was a very out going take charge mom and she was very expressive and she would hug you in spite of whether you knew how to hug or not. She was kind and compassionate. She was very much in charge of having a good time and cooking big and she was the life of the party. She also seemed to read right into your eyes if you were not doing well and she would not turn her head. She would get to the bottom of it and pray with you and show so much love and affection you would feel better. Mom Ballestero came from a family of eight children and she would share stories with me of most every Sunday their family would have a big family dinner and they invited their friends and bring folks home with them and they were caring Hospitable family of Gleason’s Mom was a worshiper with all of her heart. She didn’t whisper her prayers like me she prayed with fervor to the top of her voice. You just knew God answered her prayers. And today it has affected the family strong. 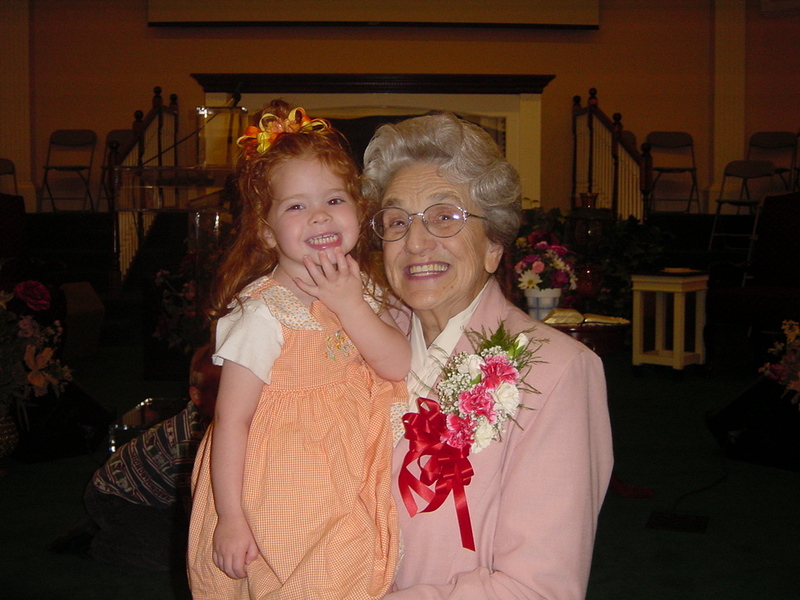 All of her children, grandchildren and great grandchildren are serving God. Mom I remember through the years all the sweet loving way you treated me . I felt like you loved me. I married your son, but knew you would get after him if you didn’t like something he did or said to me. The great thing was you didn’t have to and I have been blessed with a fun, loving Mother in Law which I hate the mother in law jokes and it is all junk to me. I have to say you were so giving, and you loved all us kids and even made favorite deserts that we loved . The food was scrumptious and you loved to cook and serve it was a happy time. You Never acted like it was a bother. It seemed to be a delight to you. What a good Mom you were, but when the Grand babies were born you came and stayed two weeks after my momma went home and did all the cooking and house cleaning and baby caring. The homemade chicken and noodles and roast and mashed potatoes and desserts you would go all out. I was skinny when I married and I think I got on the wrong track for my body way back because you would make desserts and I would not have a taste for them. You would say oh honey try it I made it just for you. The rest of you stayed trim enough through all that but I learned just how good home made pies and cakes were not to leave out cookie bars and brownies, and home made fresh peach ice cream. It gave me a different out look on dessert. You were far better than any hospital care. When you came you were so good at babies and would take their bassinet into your room so we could sleep. You would take care of baby and even wrap it tight and turn it from side to side to see if it would sleep longer. Pretty soon you would bring baby to the door all wrapped tight and say softly baby is hungry. What a Mom. Mom had a way with animals. She found this bird walking down the side walk. What a Woman you are. I found out early in marriage how brave you are. You loved to hunt and you would tramp out into the woods with Dad Ballestero and Marty and you would go the opposite direction and sit on the stand and wait and kill what you were after. Now I tried to go one time and went back to the trailer and crawled under the covers and waited scared until you all returned. I just knew any minute a bullet would zing through the trailer and hit me. I was not used to a gun of any kind. Well I did get used to having guns safely put away in the house but not for my use. I was proud of you when your name was draw one out of ten to get to hunt Buffalo and you did get one. You made a rug out of the hide, A lamp out of the Leg and hoof, and had the head mounted. For many years somehow I allowed that big head to be above my organ at my house in South Bend, Indiana. My own Grandma Starr wanted to play the organ but could not she couldn’t stand to play and look at the Buffalo’s head and eyes starring at her. You were so good with animals as I was saying. I remember the Mynah bird and how well it talked…too well. Then Fee Fee the little white poodle , then dad brought a monkey home from Ohio from a children zoo. I love watching monkeys at the zoo but this one decided to bite your hand and you still cared for it. It was pretty nice other wise but that tail wrapped around my ankle and I stood still but almost came unglued before it unwrapped it’s tail. One day it came screaming at me and Marty stopped it you had a nice size cage built for it in the basement like the zoo with a little seat it could climb up and sit on. 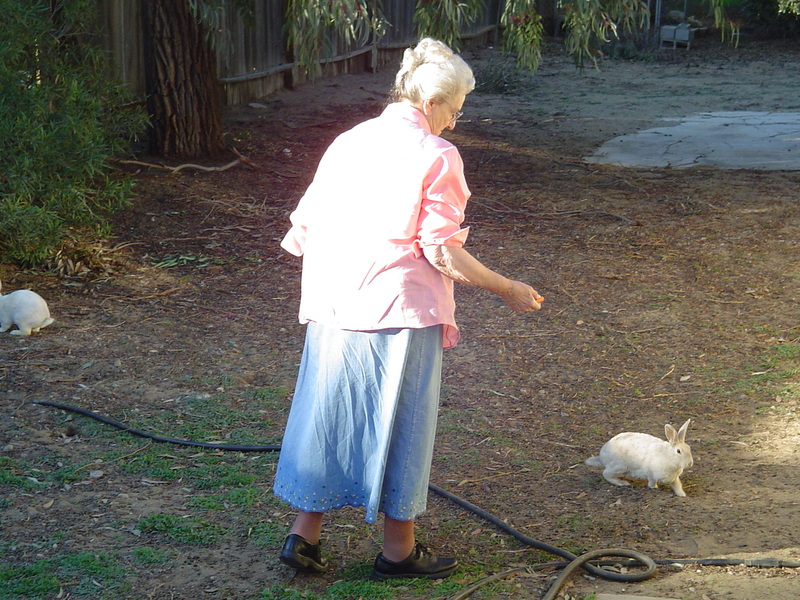 Then just a few years ago before you went to live with Nila you were living in a house in Fontana, Ca and when we came there were white rabbits, many white rabbits that were wild sleeping all around the house under bushes they found a way under your house to live. You fed them and watered them daily. There were families of them you never picked them up you had their confidence enough for them to run to the dish and wait for feedings and you talked to them. Never picking them up but they were hooked on your charm and voice and the food won them. There were baby rabbits all over. 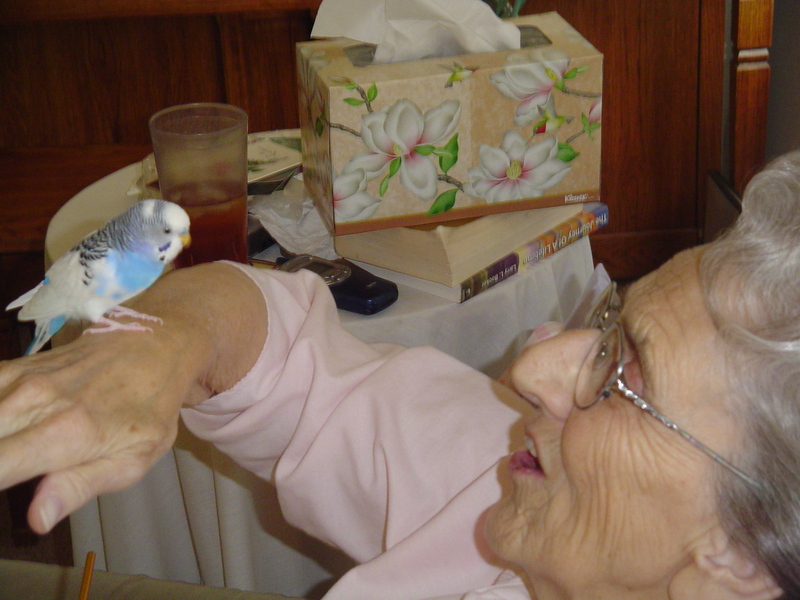 You had bird feeders all around and Uncle Stan came to live with you a while and he was almost ninety and he would go to the store and buy bird feeders and bird seeds by the huge bags. You would shake your head like why does he do that. I wondered if you two realized how much alike you were with animals and enjoying the birds coming by your windows to eat and the rabbits acting like dogs in the yard running around living there with confidence. Someone said something nice to her or gave her a sweet card. 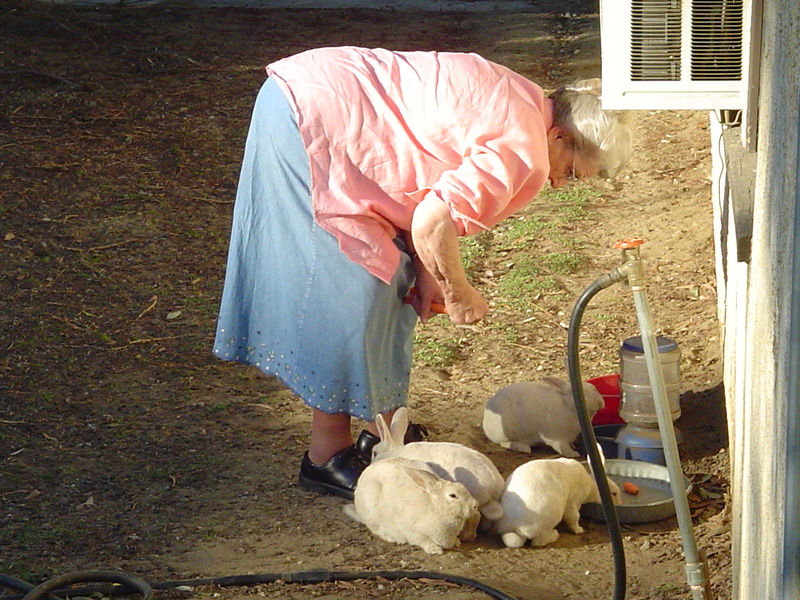 Mom and her wild rabbits that started living in her yard. The rabbits were brave enough to come close for food. 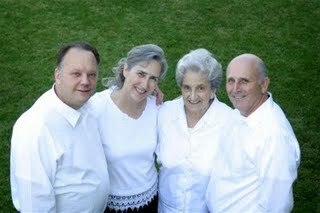 Recent picture of Mom, Marty, Nila and Eric. I Love the Man you raised for me to have for a husband. Wow!! He is still mannerly and seems to enjoy being that way. He Loves God and He loves the One God Apostolic Message unwavering. He Loves our children and has been a Rock to our family. He is a wonderful writer, preacher and father and I know he loves you so much. That is wonderful because he learned from you how to be kind, and considerate of me. I Love you Mom Ballestero and I hope and believe someone will read this to you. OK, now I can’t see because I’m crying! Marcia this is so beautiful. I am so happy that you wrote this for Sis. Ballestero. I alway felt like if my daughters didn’t love their mothers-in-law, that their husband wouldn’t be completely happy. I hope she gets to see and enjoy this. Words of love are very important. I think everyone seeks for that. How Lovely Momma, I have never heard you say anything but words of Kindess and Love about Grandma B. Always showing her love and respect even when she wasnt around. She is a wonderful person , this was beautiful! You are/were so blessed! I hope I am this kind of mother in law to my children. God bless you for sharing this! 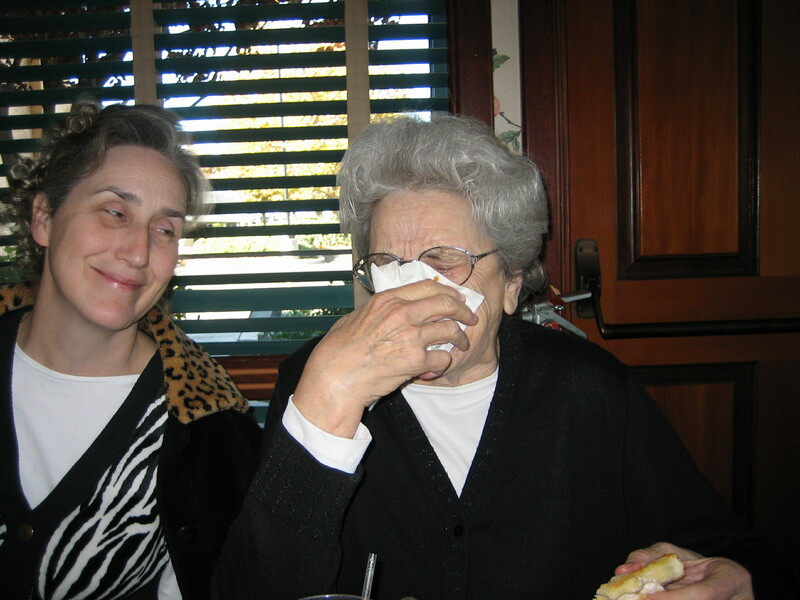 You have been an incredible, sweet and loving daughter-in-law to my mother. I thank you so much for the honor you have given her, not just today, but for all of your married life. I love you dearly, as a sister, and am so thankful for your kind, gentle ways. You are a wonderful example of a true Christian. Thank You all for your kind words. I am so glad I can write this down. I am glad I got to say things to my mother and mom Ballestero and I left a whole lot out I am sure. They deserved much more. Sue you will be a wonderful mother in law. In fact you are with your first already. I have seen how caring you are with my own eyes. Nila you were so sweet to say those words to me. I love you all dearly. Ohhhh Marcia……I am printing this off and saving it. You have such a sweet way with words and are not afraid to express love. What a tribute! You always were a defender of mom even to me. You would wait until mom was gone and you were in charge of me (at 9 years old) and came out with a belt and said…..”You don’t back talk your mom like that again!” I never forgot that. Thanks for defending her always. When I came to her apartment yesterday, she had this letter in her lap and she keeps reading it over and over. It has meant more to her than any gift, card or flowers. It is so true that the power of life or death is in the tongue. You are an awesome writer. I enjoy your blog very much. keep em coming! By the way, none of us ever think of you as an inlaw……you are without a doubt bloodline and we love you very much! Praise the Lord! Thank you for sharing your thoughts on Your Mother in Law ……..I hope Im That Kind of MIL like Sis. Ballesteros…I have 3 daughters…And I know that I will need wisdom. I think its best when our kids get married never to really know whats going on in their marriage. I tell my daughter when you get married dont even tell me anything about your mil dont want to know what I dont need to know…….. I do Love Mom Ballestero. Ramona Thank You for those kind words. You all have Loved Mom so much too. We are a bunch of strong women and yet we are very tender inside. Life has been good because of our parents knowing God before we even arrived how blest we are. I just clicked on your page to see if you had written anything today & saw I missed this yesterday. OHMYWORD!!! I am so tired but just got myself all worked up, crying at your beautiful words to my precious Mother. I agree with my siblings….you have always treated my mother with love & respect & I love you for that. And even tho you are my SIL, you are my sister at heart!! Love you & always enjoy being around you. Words are beautiful when the one for whom they are written can enjoy them. Thanks for pouring out your heart like Marty says. Sis. Ballestero is so worthy. Sis. Marcia, I can not express my thanks to you for this Awesome expression of your love for Sis. Ballestero. I know that we’ve all seen the Lady that you are honoring from a different view, mainly always at church or some church event, and found her to be the most godly, loving, respectful, lady ever. But to hear her daughter-in-law of so many years be able to give such a wonderful, glowing tribute is simple amazing and admirable. Thank you again for your inspiration. I love you. This too is a fitting tribute to a godly lady. I did not know her well, but was privileged to meet her while at A.B.I. and to hear good things about the Ballestero’s from Bro. Wendell Gleason. Enjoyed Bro. Carl Ballestero’s preaching when I heard it and took note of the way “Sis. 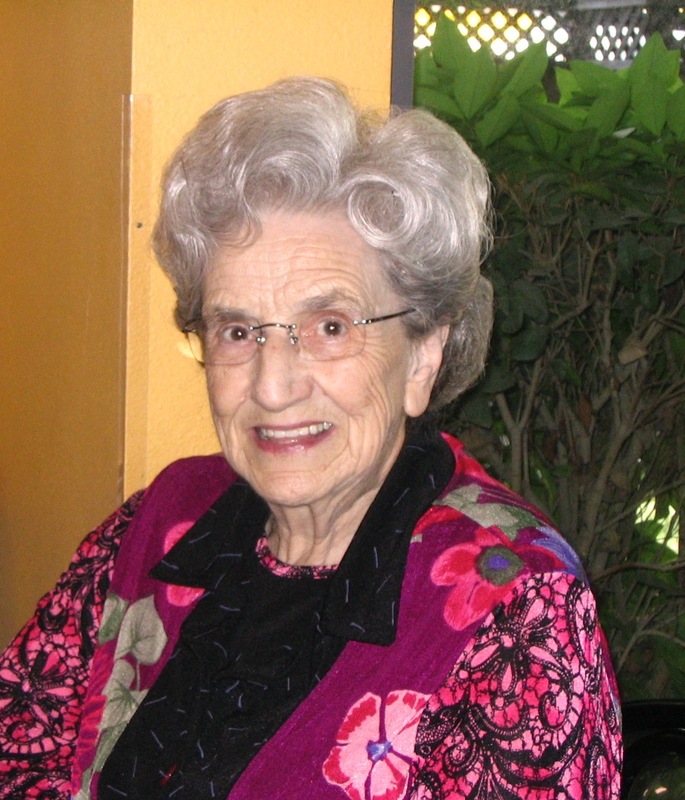 Connie” complimented his ministry in her own inimitable way. Later, the A.B.I tour choir sang at their church in Indiana, and that too was a wonderful memory.